You'll be £14.99 closer to your next £10.00 credit when you purchase The Bloody Road to Tunis. What's this? As the Afrika Korps withdrew after a bruising defeat at El Alamein, it became apparent that Axis forces would not be able to maintain their hold over Libya. Rommel pulled his troops back to Tunisia, digging in along the Mareth Line, and turned westwards to counter the massive Anglo-American 'Torch' landings in French North Africa. A series of bitter battles in the craggy hills of Tunisia followed - including the legendary struggle for the Kasserine Pass - with the Germans displaying skills honed in two years of desert fighting, and the Allies relying on their superiority in equipment and manpower. Allied might eventually overpowered Rommel's army and, in May 1943, Axis forces surrendered. 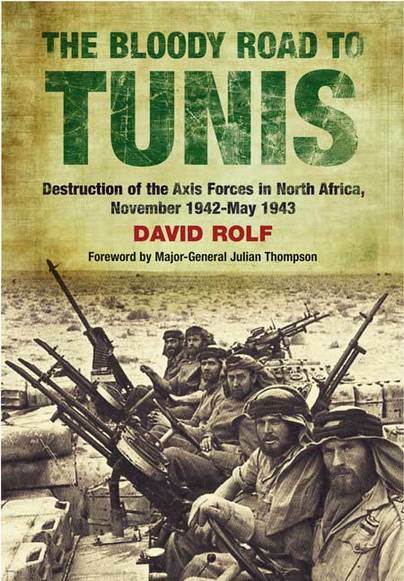 David Rolf has made use of rare and valuable source material to present the Tunisian campaign in its entirety. His emphasis is on personal accounts, and use of contemporary dialogue, takes the reader to the heart of the emotions experienced by units fighting on both sides, and adds colour to this intricate 'battle of wits' between legendary commanders. The result is a brilliant example of historical writing and a unique insight into six months of stubborn fighting. Although I am 'specialized' in World War 2 European Theatres, I DID read quite a lot about the war in Northern Africa back in my youth. And I built some interesting scale models at the time, notably of aircraft and of SAS vehicles and crews. Enough to rekindle my interest and digging deeper now that I have some more time. David Rolf's book is an excellent guide for that, and in specific in getting a better understanding of what went on after the allied landings of Operation Torch. David did a LOT of research, clearly visible from the truckload of references to material studied and quoted in each chapter. Yes, he provides a detailed insight of all the troop movements and the many different units involved in the various battles, illustrated with some great maps! But equally important, at least to me, is that he describes the various commanders and officers involved, with their peculiarities, their strength, weaknesses and quarrels. A war, any war, is much more than people shooting at each other in a string of battles. And a good book describing past wars and battles is also more than a listing of units and material (although this book does that too!). A good war account provides the reader with background as to why and where, and provides insight in what happened as much as who did what. David Rolf's book excels in the latter, describing the various tensions between allies and French, between Germans and Italians, and also shows the complicated role some of the French forces and commanders played. Not sure on which side they were, even today ! TIP: My way to enjoy the book to the fullest was to make a copy of the various maps pages, and keep the copies along while reading, so I could easily refer back to the description of the various places and troop movements. Particularly important if one is not familiar with all the local names.